Texting while driving: the development and validation of a distracted driving survey. Texting and other cell phone use while driving has emerged as a major contribution to teenage and young adult injury and death in motor vehicle collisions over the past several years (Bingham 2014; Wilson and Stimpson 2010). Young adults have been found to have higher rates of texting and driving than older drivers (Braitman and McCartt 2010; Hoff et al. 2013). Motor vehicle collisions are the top cause of death for teens, responsible for 35 % of all deaths of teens 12–19 years old, with high rates of distraction contributing significantly to this percentage (Minino 2010). In 2012, more than 3300 people were killed and 421,000 injured in distraction-related crashes in the US, with the worst levels of distraction in the youngest drivers (US Department of Transportation National Highway Traffic Safety Administration 2014). Acusensus is very humbled to announce that we have been accepted into the prestigious Melbourne Accelerator Program (MAP), one of the world's top university lead accelerators. Acusensus is this year's social impact startup, with part of its grant from the program coming from the Cameron Foundation. Acusensus is very pleased to announce the appointment of Andrew Matthews as our new operations director. Andrew has an enormous amount of experience in the safety camera industry, being the former Head of Delivery and Operations for Australia's largest enforcement camera provider. In his distinguished career in camera enforcement he has managed delivery, maintenance and service activities, including the delivery of large volumes of camera enforcement systems which include, speed, red light, bus lane enforcement, transit way enforcement, tolling, point to point, engine brake noise enforcement (EBNES) and vehicle emission enforcement systems (VEES). Most significantly, Andrew developed the original outsourced mobile speed camera program in NSW from inception and managed its extremely successful expansion in 2014. Acusensus + Ador: An investment that will fuel innovation on the road. Ador recently announced an investment in Australian traffic and safety enforcement specialist Acusensus Pty Ltd, taking a majority equity position in the company. Acusensus specialises on the use of radar, cameras and software for unique path breaking innovative solutions to identify and create infringements for driving whilst distracted, such as texting or using an electronic device whilst driving, seat belt usage, and other related traffic safety offences. Alexander JANNINK, Managing Director Acusensus said, "This investment by Ador will help further speed up our R&D cycle and support the pilot projects we are currently working on implementing globally in geographies where distracted driving is a significant source of traffic accidents. We are pleased to partner with Ador who will also support us in our international growth efforts.' Ravin MIRCHANDANI, Chairman Ador said "Ador is working on a number of different projects within the Traffic and Defence sectors that utilise software to make cameras intelligent for various applications. Our investment in Acusensus will provide a significant IP advantage to not just our traffic and enforcement solutions but also our current pipeline of defence, perimeter & border protection as well as airfield protection projects." The investment agreement was concluded by both companies recently. 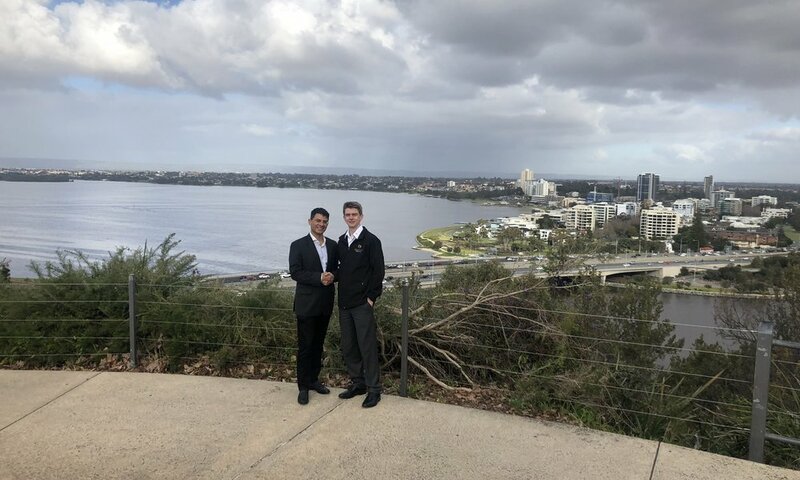 Pictured: Ravin MIRCHANDANI, Chairman Ador Powertron and Alexander JANNINK MD, Acusensus Pty Ltd.
Our solution was recently evaluated and demonstrated to a major Australian safety services provider and potential partner. Their technical experts said that the solution is "sensible and has focused on the right things, like no moving parts good camera capture and the solution around creating clear images in different light conditions is clever". During the test in the afternoon along Dandenong Road inbound to the city in Melbourne Australia, 1.3% of drivers were found illegally using a mobile phone, and 4.7% were found speeding excessively at more than 10% over the speed limit. The distracted driving prevalence in this test was lower than our usual finding of 2-3%. We care deeply about Distracted Driving. Not only is it a causal factor in over 9% of road accidents, but it has touched us personally. In 2013 I received the devastating news that my friend James was killed by a texting driver. Losing James had a profound impact on me and led to several weeks of heartbreak and anguish. When I spoke at his funeral I concluded with the statement that "If there was one person I knew who was going to change the world for the better it was James". The sad reality is that road trauma touches almost everybody in some shape or form, and my experience is not unique. It unexpectedly cuts down people in their prime, leaving behind immense sorrow in family and friends. Globally road accidents kill over a million people per year. I wanted to find a solution, something to stop another James event, but it took me several years and several attempts to finally directly address one of the causal factors of James' death. With some inspirational guidance from advisors I sought to implement the solution and finally reduce the road trauma associated with distracted driving, which causes almost 4000 deaths and 400000 injuries in the USA alone. I was tremendously fortunate to have good contact with Kamran Khan of the Australian Trade Commission who let me know exactly who would share the vision and make the implementation a success. Ravin Mirchandani brought the necessary spark to bring the business to life and make the dream happen. I look forward to seeing our solutions successfully implemented throughout the world and the fatality and injury rates dropping. I look forward to James changing the world for the better once again even through tragedy.